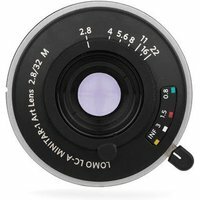 The Lomography 32mm f2.8 Minitar Art lens is compatible with all Leica M-Mount range-finder and mirrorless digital cameras. The glass used to make the optics for the lens is multicoated to minimise internal reflections and maximise colour and contrast. Its 32mm wide angle view is great for portrait, landscape and travel and its bright f/2.8 maximum aperture allows you to keep your shots natural in low light conditions. The signature vignetting, sharp contrast and rich character of the LC-A legacy can now be achieved on a wide array of both digital and analogue cameras. Additionally, you can pair the Lomo LC-A Minitar-1 Art lens with many other compact system cameras using adapters which can be purchased separately.